This week the world celebrates Ganesh Utsav, the most joyous celebration of the Indian Calendar. Ganesh is without question the most loved Divine Murti* of all. He is the Ish (the Lord) of all Gan, of all us common folk. No one is high or low in front of Ganesh. We, his Gan, are all the same. Every year the arrival of Ganesh brings radiant joy to every Indian household and lights up lives of every one who loves Ganesh. He is the giver of Buddhi or intelligence and he is the Vighna-Harta, the remover of all obstacles. His is the ultimate universal message and He can be reached by anybody, regardless of religion, ethnic origin or nationality. Lokmanya Tilak, the great leader of India’s Independence movement, must look down from heaven at today’s Ganesh Utsav and be pleased. The modern Ganesh Utsav was his idea. The British had banned mass gatherings of Indians for political purposes. 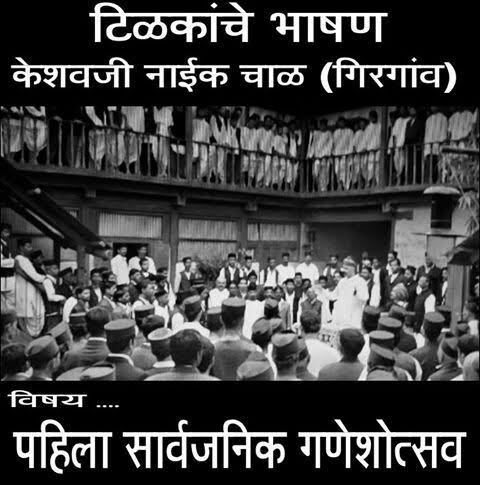 In 1893, Tilak launched the first public celebration of of Ganesh Utsav. He transformed the celebration of Ganesh from a private family event into a societal event. It was a brilliant idea and it worked magnificently. It became an event for all Indians to unite & bond together. Political unity followed. 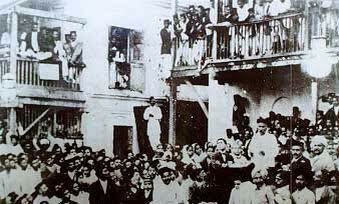 Below are a couple of photographs of the first public Ganesh Utsav gathering in Mumbai in 1893 that we received this morning from a technology executive & childhood friend. Today’s Ganesh Utsav is something you have to see for yourselves. 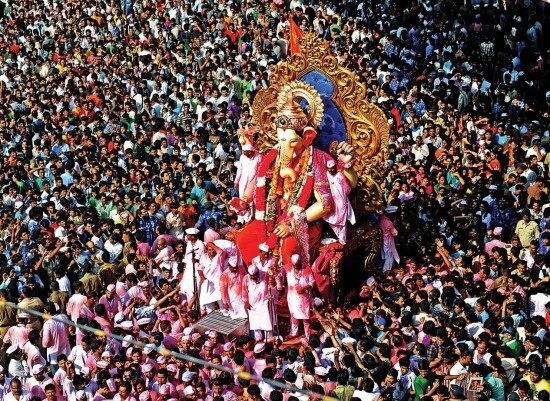 Mumbai, the city of origin of the modern Ganesh Utsav, has over 15,000 neighborhood committees that organize and manage the Ganesh celebrations in their area. From its humble origin in a building in Girgaon, Mumbai, the Ganesh Utsav has become a global event. This year’s Ganesh Utsav in Edison, New Jersey is billed as the largest celebration in the World. Outside Mumbai, we assume. Because nothing can match the passion of Mumbaikers for Ganapati. 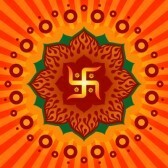 “You are the Only Creator, You are the Only Preserver, You are the Only Destroyer, You are verily the Entire Brahman. … The entire Universe has been created from You; the entire Universe resides inside You; the entire Universe dissipates into You; … You are Brahmadev, You are Vishnu, You are Rudra, You are Indra, You are Divine Fire, You are Divine Wind, … You are the Primordial Sound… Illuminate us with Your radiance”. *The ultimate Brahman is beyond our comprehension & is without any form or attributes recognizable by us. It is in effect A-Murt (or A-Moort) or beyond tangible. A Murti (or Moorti) is what converts the non-tangible or A-Murt into a tangible or Murt form. That is why a physical representation of Brahman is called a Murti and a Murti is worshipped with the clear understanding that it is merely a Roop (Representation) of Brahman. That is why you see so many different Murti of Ganesh, each drawn or built according to the way that person sees Ganesh in his/her heart.